Elevation 2001: Live from Boston is a concert film by Irish rock band U2. It was released as a two disc DVD set by Island Records in the United Kingdom on 26 November 2001, and by Interscope Records in the United States a month later. The video documents three concerts by the band performed in Boston, Massachusetts during the first American leg of their 2001 Elevation Tour (see 2001 in music). It was the first of two video releases from the tour, the second being U2 Go Home: Live from Slane Castle, Ireland. Two "Easter Eggs" are also included on the DVD, these are the Bono Cam views of "Until the End of the World" and "Elevation" from June 9, 2001 in Boston. In fact the whole DVD/VHS although labelled as being from June 6th, is actually mixed footage from June 5th and 6th, with additional Bono cam footage from June 9th. The concerts were filmed by Hamish Hamilton and produced by Ned O'Hanlon. Both of the two mentioned have worked with U2 on several other occasions including U2 Go Home and Vertigo 2005: Live from Chicago. Easter egg No. 1 - To access the Easter egg, click the "Making of the Filming of". Fast forward to the end and look for the Dreamchaser logo in the credits. At the top of the logo, you will see a little Bono head. Click on it as quickly as possible. Next, you will see a screen with flashing cubes. Enter the following: "1 enter, 9 enter, 7 enter, 6 enter" while the cubes are flashing to access the special BonoCam feature for the first 4 minutes of "Elevation". Also the audio during this is straight from Bono's ear monitor. Easter egg No. 2 - To access the Easter egg, go to the help menu (the question mark in the bottom left). When in the help menu you enter "1 enter 9 enter 9 enter 1 enter" and you see "Until the end of the world" from the BonoCam. 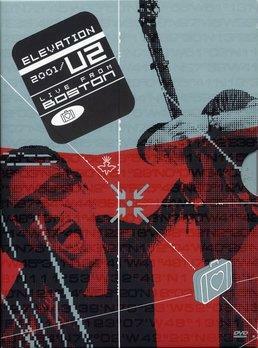 ^ "U2: Elevation 2001 - Live from Boston [2 Discs]". ^ a b "Certification Search Results" (PHP). ^ a b "Gold & Platinum Searchable Database" (PHP). Search for U2 under Artist Name in the Advanced Search section and select Video Longform. ^ "The ARIA Report (Issue 616)" (PDF). ^ "Musik DVD Top-10: Uge 49 – 2001" (ASP). Hitlisten (in Danish). ^ "Top 20 DVD, Week Ending 6 December 2001" (JSP). ^ "Sverigetopplistan". Search for U2 and click Sök. ^ "Argentinian video certifications – U2 – Elevation Tour 2001". ^ "ARIA Charts – Accreditations – 2004 DVDs". ^ "Brazilian video certifications – U2 – Elevation 2001: Live from Boston" (in Portuguese). ^ "Canadian video certifications – U2 – Elevation 2001 Tour: Live at Boston". ^ "French video certifications – U2 – Elevation 2001: Live from Boston" (in French). ^ "Gold-/Platin-Datenbank (U2; 'Elevation 2001')" (in German).